Welcome to the Parents section of the Okaloosa SCIENCE website! Here, you will be able to find out how parents can be involved in some of our awesome Okaloosa SCIENCE activities! Okaloosa SCIENCE is a STEM initiative funded by the Department of Defense Education Activity (DoDEA). This innovative project seeks to enhance STEM education for students by utilizing hands-on, experiential learning activities to teach science standards both inside and outside the classroom. With support from national and local partners, participating teachers will infuse elements of Okaloosa SCIENCE into their classrooms and after-school programs. 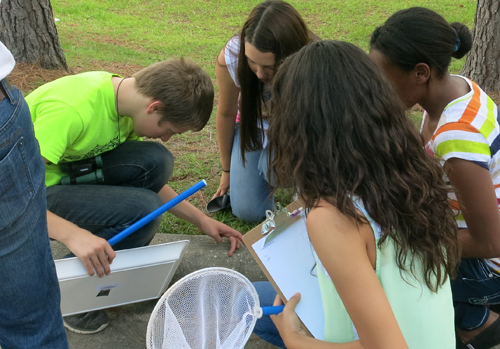 The project utilizes resources from within the Okaloosa community and the incredibly diverse surrounding environment to help students gain a more connected and real-world understanding of scientific concepts and standards. For more information on the project, please click here. In recent years, the U.S. has lagged the rest of the world when it comes to STEM-related education. According to the World Economic Forum, the United States ranked 48th in the quality of mathematics and science education in 2009. By 2011, the U.S. ranking dropped to 51st.1 As the U.S. falls further behind, real-world consequences are becoming more apparent. A 2012 study showed that in STEM-related occupations, jobs outnumbered unemployed STEM workers by a ratio of 2-to-1.2 Many jobs go unfilled simply because there is a lack of people with the right education or skill sets. In addition, research shows that STEM-related programs, and in particular experiential learning 3 and service learning 4 programs, enhance resilience in children. For military students, this type of educational programming can provide needed support during stressful periods such as moving to a new location or deployment or reintegration of a loved one. - Community Service Projects: We encourage parents to participate with their children in community service projects that involve the whole family. Not only can these projects be great family activities, but they also help build character and promote positive role modeling for children. In addition, if you own a business or have an idea for a community service opportunity for students, let us know! - Chaperones: Parents can help chaperone their students’ classes to an Okaloosa SCIENCE field experience. If you are interested, please let your child's school know you are interested in chaperoning for one of our cool field experiences! You will need to fill out appropriate paperwork in order to become a chaperone, if you haven't done so already. - Camera Trapping Teams: Parents can participate in Okaloosa SCIENCE camera trapping teams, as part of the Smithsonian’s eMammal project. Interested volunteers are required to attend an initial training regarding camera trapping, navigation, research methods and data reporting. Participating in the eMammal project is an outdoor activity and requires navigating Eglin Air Force Base recreational areas or Blackwater River State Forest via vehicle and/or by foot, hiking off trail, and 2-4 hours every 3 weeks for camera deployments. Finally the project requires basic computer skills for uploading camera trapping data to the Smithsonian for student use and analysis. For more information, please contact the eMammal volunteer coordinator (Megan Baker-Whatton) at: emammaloklaoosa@gmail.com. - STEM Guest Speakers: Some schools will be inviting individuals from the community to come and talk to students about how STEM plays a role in their everyday jobs. If you are interested in speaking to students about the role STEM plays in your job, let us know! We can then contact you when a school has a need for guest speakers. To be on our email list, please send an email with your contact information to: okaloosa.science@yahoo.com. Okaloosa SCIENCE has many exciting programs and fun events coming up throughout the school year! To find out more, check out our calendar. 1. World Economic Forum (2011). The Global Competitiveness Report 2010-2011. http://reports.weforum.org/global-competitiveness-2011-2012. 2. Change The Equation. (2012). VitalSigns: STEM Help Wanted. Washington DC: Change The Equation. 3. Charles, C., Louv, R., Bodner, L., Guns, B., Stahl, D. (2009). Children and Nature: A Report on the Movement to Reconnect Children to the Natural World. Santa Fe: Children & Nature Network. 4. Markus, G., Howard, J. & King, D., Integrating Community Service and Classroom Instruction Enhances Learning: Results, Educational Evaluation and Policy Analysis. December 21, 1993. 15: 410-419.